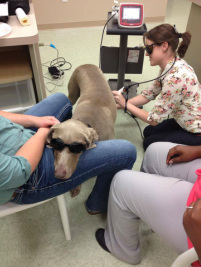 Greenbrier Veterinary Services is proud to be able to offer the latest in Companion Animal Healthcare - including Laser Therapy. The Companion Therapy Laser utilizes an intense light beam to penetrate into deep tissue to stimulate cellular metabolism, repair, and reproduction. This helps to create an internal, soothing heat source and also to jump-start the healing process. To find out more about how Companion Therapy Laser can help your pet, please follow this link to the LiteCure FAQ Webpage. Each of our staff members were individually trained in the safety and use of the Companion Therapy Laser.